Right from one knitting project to another….well I can’t just sit in front of the TV at night doing nothing can I ? 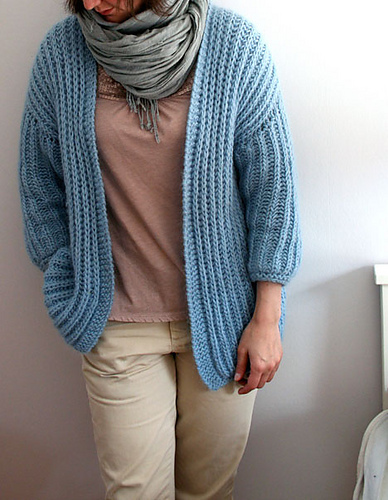 Shannon of luvinthemommyhood is hosting a Summer Sweater Knit Along. Are you coming to join us? It was launched a couple of weeks ago, but I forced myself to finish my Abalone cardigan before I even knitted up a swatch (gold star for me!). The colours really don’t look like they go together, but actually when they are knitted together I quite like the result, almost tweed-like! I’m using a Lion Brand Wool-Ease Worsted that I picked up in Jo-Ann’s whilst in Florida earlier this year and I am knitting it together with some ggh Soft Kid that I picked up at my local yarn store. I do however need to check my yardages. I have a nasty feeling that I don’t have enough of the soft kid to make it to the end of this project. It may end up being a little shorter than planned! The on-line search for yarn shall begin in earnest….. Here is where I have got to so far…. I’m a good 9 inches in with about 8 inches more before I split for the armholes. I’m making fairly swift progress which pleases me greatly! If you would like to join in the knit along drop but the luvinthemommyhood blog and register your details. There is of course also a group on Ravelry to share your work in progress, successes and ‘issues’. See you there! OHhhhhh…LOVE!!!!!!!!!!!!!!!!!!!! Those colors together are amazing! in agreement with Shannon. 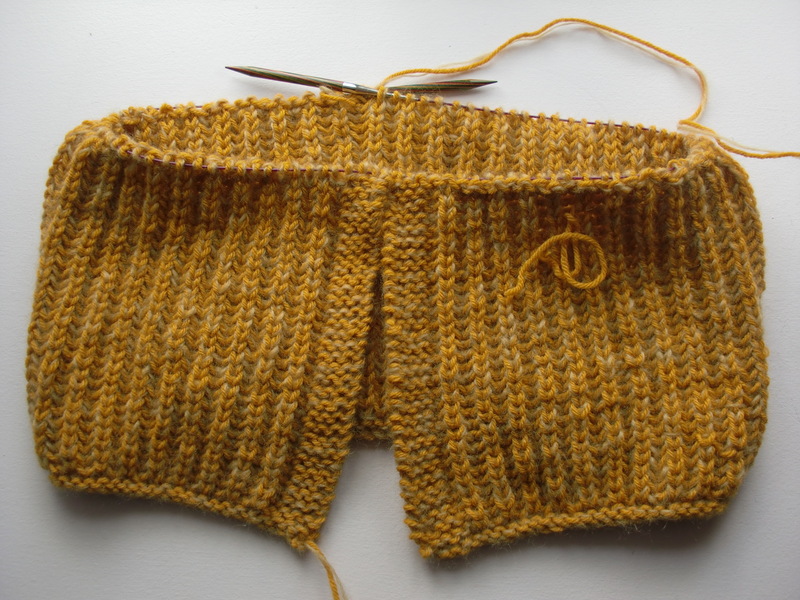 The kid soft really..softens.. the yellow, love the tweedy look…and I’m all for a speedy satisfying knit! go you! I love the combination of the colours, they look really great together! I love those colors together, also! 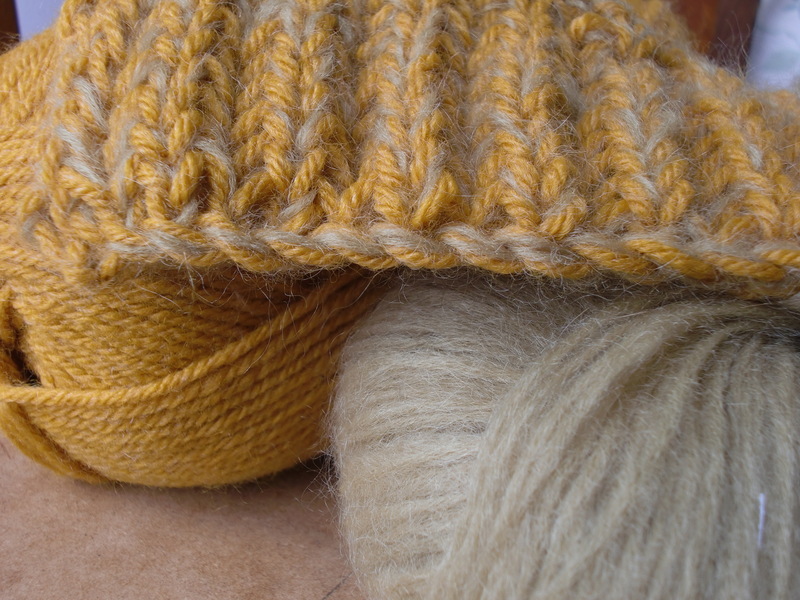 Are you using two yarns (is yarns a word?) to get the proper weight and gauge, or does the pattern call for that? It looks challenging!